In November 1974 Ronnie Glavin became Celtic’s most expensive signing when he arrived from Partick Thistle for a considerable fee of £80,000. Media reports at the time stated that Ronnie had declined the advances of Tommy Docherty’s Manchester United to join Celtic although it should be noted that the Old Trafford outfit were a second division side at that time. Although Ronnie won a Scottish Cup final within months of his arrival, things did not go smoothly and he struggled for a considerable period to find his best form in the Celtic midfield. By the summer of 1976 there were doubts about his Parkhead future as Jock Stein returned to the helm as manager after a year’s absence whilst recovering from a serious car crash. Stein’s master stroke was to sign the experienced Hibs’ captain, Pat Stanton, which allowed him to push the eager, young, Roy Aitken into midfield. This move allowed Ronnie Glavin to have a free reign as an attacking midfielder in the knowledge that Aitken would then look after any defensive responsibilities in that area. On Wednesday 20th October 1976, Dundee United proudly arrived at Celtic Park unbeaten and as league leaders. Jim McLean was in the process of moulding a fine young team and his developing players, David Narey, Paul Sturrock and Graeme Payne were earning admiring glances from Britain’s major clubs. Although this was a top of the table clash the main media focus on the night was on the big two Edinburgh clubs who were Scotland’s two remaining competitors in European competition. Hearts went down bravely by 4-2 to the eventual winners SV Hamburg in the European Cup Winners Cup in West Germany whilst Hibs defeated the Swedes of Oesters Vaexjoe in the UEFA cup at Easter Road. Back in the east end of Glasgow Ronnie Glavin was about to blaze on to the scene. Only one minute was on the clock when he ran on to a loose ball outside the area to send a glorious volley crashing past Hamish McAlpine to give Celtic the lead. United were not to play badly on the night but they lacked Celtic’s cutting edge and in the second half the Celts ran riot. Firstly, the peerless Kenny Dalglish sent through a typically perfect through ball for Joe Craig to score Celtic’s second before Glavin was to hit peak form. 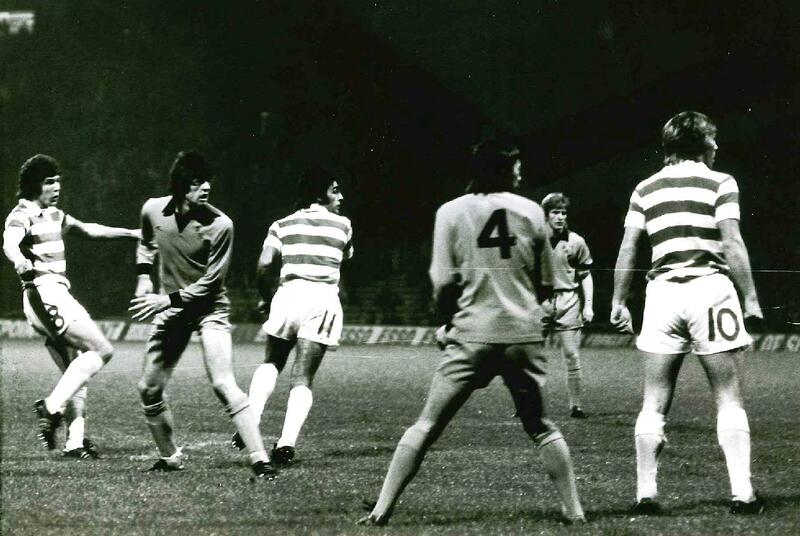 In 75 minutes David Narey lost possession to Ronnie outside the area and the Celt then advanced on goal to beat the United keeper with a delightful chip into the net. As the Celtic fans roared on with approval, Ronnie clinched his hat trick five minutes after that when Roy Aitken set him up to score with a powerful shot on the turn. Veteran striker Bobby Lennox rounded off Celtic’s scoring before United’s Paul Sturrock scored a late consolation goal. However, there was no doubt that this had been Ronnie Glavin’s night with a stunning hat trick as he gave an attacking midfield performance that drew comparisons with the great Bobby Murdoch at his peak and it was said that Parkhead had not witnessed such a devastating display of power shooting since the days of Tommy Gemmell which was praise indeed. Any doubts about the merits of Ronnie Glavin’s ability were banished that night and the Celtic fans in the Jungle chanted his name loudly at the final whistle. This game had been a turning point and he continued this rich vein of good form throughout the season and was instrumental in Celtic’s success of winning the League and Scottish cup double. Many observers believed that he was desperately unlucky not to be awarded as Scottish player of the year, narrowly losing out to fellow Celt Danny McGrain in the end. This game was the turning point in Celtic’s season and Ronnie Glavin had provided the inspiration by giving what was arguably his greatest performance as a Celt.